SEED TREATMENT™ contains nutrients and compounds that enhances seed germination and seedling vigor. Deeper, more extensive rooting insures more consistent plant stands, increased nutrient uptake and healthier, more vigorous seedlings. 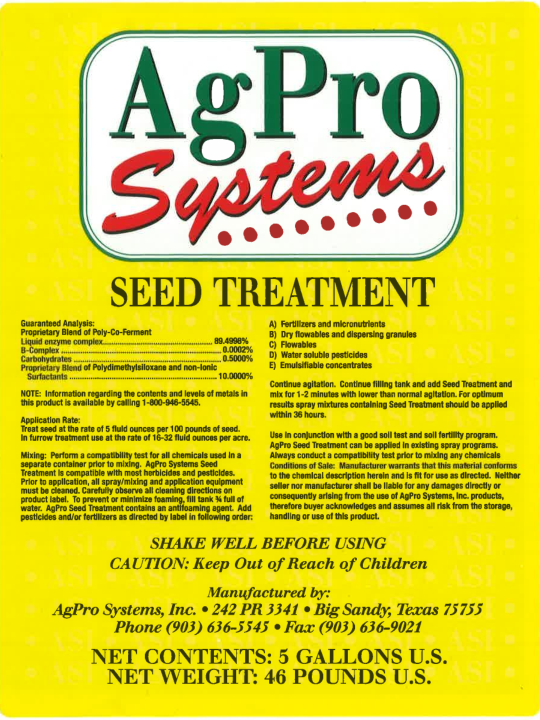 AgPro™ SEED TREATMENT™ is a product formulated for soil and seed interaction to stimulate faster germination, healthier seedling vigor and rapid development. It is a proprietary blend of fermentation extracts, organic acids, plant extracts and surfactants. The ingredients enhance soil activity and allow more rapid seed germination. Stimulation of microbial activity creates an environment for the greatest possible yield potential. Roots develop more bio-mass enabling the plant to gather nutrients more efficiently and in greater quantities. Another obvious effect is the plant’s ability to withstand drought stress. The preferred treatment is in the row at planting so we can affect the environments around the seed as well as the seed itself to set the yield potential as high as possible. Strong healthy plants are less susceptible to insects and disease. Add SEED TREATMENT™ and mix with normal agitation.